Speakers: Mike Gibson Hove Station Neighbourhoods Forum Management Committee Rob Frazer Principal Planning Officer Brighton and Hove City Council. Last year the Council published its Draft City Plan. This includes proposals for the large-scale redevelopment of Development Area 6 Hove Station to provide a minimum of 750 new dwellings and 13,000sqm of modern office/business employment floor-space. Within this framework market forces will redevelop DA 6 and transform this part of Hove. A planning application has already been approved for the £100m redevelopment of the Sackville Trading Estate for a combination of housing, offices and shops. Other employment areas along the Shoreham Road could well come under development pressures. Matsim, a local developer, has publicised a similar mixed use scheme for the Conway Street Area which involves the relocation of the bus station, but has not yet submitted an application. During the next few years there may well be growing pressures for the redevelopment of the Greyhound Stadium area, following the takeover of the Co-op by John Lewis. ‘Business as usual’ will be a piecemeal process, with residents’ role restricted to reacting to planning applications as developers bring them forward. But, supported by Hove Civic Society, the Forum wants to develop Neighbourhood Plan policies for a more integrated approach. This would realise the potential for a new centre for Hove focussed on DA 6 and promote change elsewhere which is supported by local residents. The redevelopment of DA6 Hove Station will have major impacts on all surrounding neighbourhoods. There will be increased pressure on community facilities such as schools, recreational facilities and health services north of the Shoreham Road, which will have to be met by ensuring additional provision – in part funded by financial contributions from developers. Effective traffic planning will be essential. The publicity surrounding the Matsim proposals prompted Goldsmid councillors, supported by the City Planning Officer, to call public meetings from which the Neighbourhood Forum developed. In July last year we adopted a formal constitution and established a Management Committee elected by signed-up members. Members have been recruited primarily through Have Your Say Days. We now have over 80 members and over 100 plus supporters. But the distribution is uneven so we are giving priority to attracting new members from north of the Shoreham Road. Our Vice-chair Nigel Richardson is the CEO of Custom Pharmaceuticals in Conway Street and a Hove Park resident. Alan Moody, chair of Friends of Hove Park, has recently joined our Management Committee. We hope that this meeting will encourage more Hove Park residents to join us. From Hove Station Neighbourhoods Forum to Hove Neighbourhoods Forum? The area north of the Shoreham Road will be affected by the large scale redevelopment of DA6 and the community assets north of Shoreham Road are used and highly valued by families living in the more densely developed neighbourhoods south of Shoreham Road. That is why the propose boundary is drawn as it is. 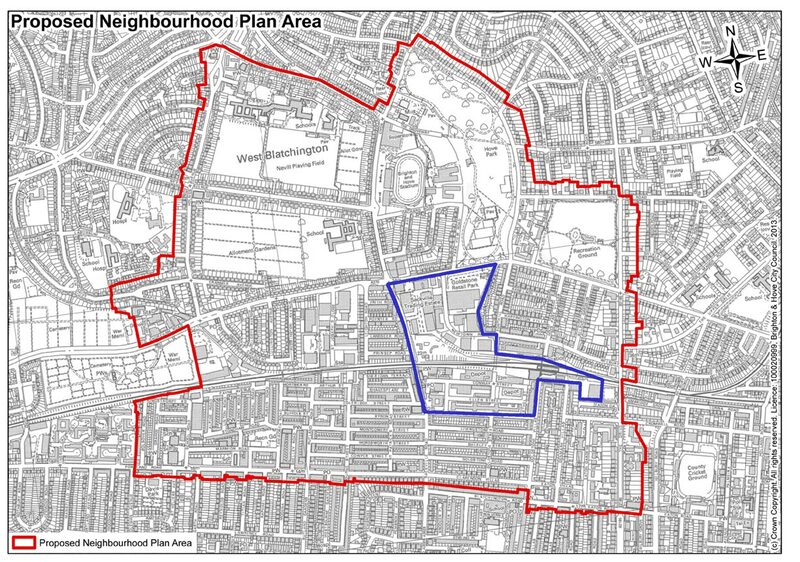 But this produces a ‘democratic deficit’ as Hove Park residents outside the boundary cannot directly participate in the development of the Neighbourhood Plan. Their interests would have to be represented by residents living within the boundary and ward councillors representing residents living both within and outside. The Hove Station Neighbourhoods Forum Management Committee would be happy to consider extending the boundary north and east to include more of Hove Park if there is significant interest from residents. We could then re-constitute to form the Hove Neighbourhoods Forum and prepare the Hove Neighbourhoods Plan.